This Bigfoot sighting took place in Oregon. I was the tender age of twelve when I had my first encounter. I didn't really believe in Bigfoot at the time. To me, it was something that some crazy adults believed in, and it was fun to watch about it on "In Search Of..." when I was younger. I think I had even read Marion T. Place's book about it in grade school. It all changed in the summer of 1982, when a friend, Troy, and I were riding our bikes in the back woods, down some old logging roads. Some of the roads were washed out by deep ravines, and one of these ravines, we found, could be crossed by a recent tree that had it's roots undermined, and had toppled over to form a bridge. Troy and I had crossed over that bridge earlier, and were on our way back the way we came and recrossed the ravine. There was a stream near the road, fed by one of the many springs we found in the area, and we had stopped to look for crayfish, I think, and to pee, as well. It was a deep resounding voice which uttered this noise, and it was close. I turned to my left, and there it was on the other side of the ravine. The biggest thing on two legs that I had ever seen, and I had seen a pro basketball player, Brian Trendell, up close. This creature was taller than he, and massive. My estimate was over eight feet. It had long, maybe four to six inch, black hair all over it's body. It was muscular, like a gorilla. This thing was looking at me, right into my eyes, and then, it did something which kicked the fear level even higher. It grinned. Then it stepped on the fallen tree. Troy and I screamed and took off, riding uphill as fast as we could. I looked back, and this creature had crossed the tree and started a loping run, which spurred my friend and I into even greater speeds and I don't think I have ever ridden a BMX bike that fast. We hit the top of the hill and the road leveled out, and we were pedaling like our lives depended on it, and, at the time, we thought this thing was after us to eat us or whatever it is that monsters do. 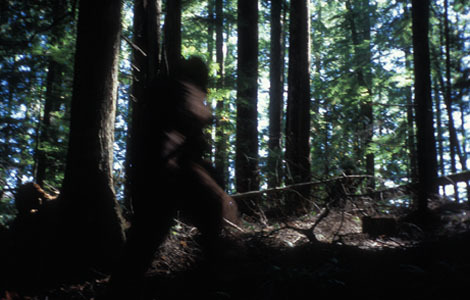 I heard rhythmic footsteps, and looked back and the Squatch was gaining on us. I kept up my furious pedaling passing up Troy, who was smaller and weaker , and looked back again. It was keeping pace with us, about 40 feet behind Troy. I knew that I would be the one likely to get away when it grabbed Troy, and I liked him as a friend, but I would be damned if that thing was going to get me. "Troy! It's right behind you!" I yelled between terrified sobs, and I heard Troy's cry get louder, as he was bawling in terror. I pushed myself as hard as I could and was nearing exhaustion when we finally reached a paved road, and I looked back, to see the creature veer off into the woods. Troy was alive, still, which I was glad for, and both of us, crying and sobbing, rode home. It took me years before I was able to go back into the woods again by myself.